Are you in the market for a Katana? 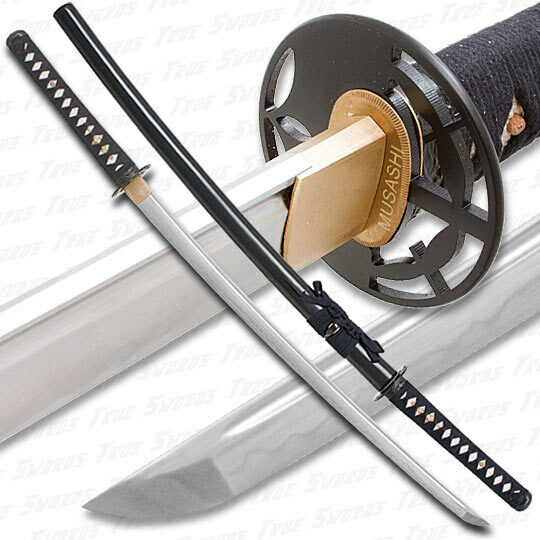 True Swords is proud to offer several of the most reliable Katana name brands on the market today! 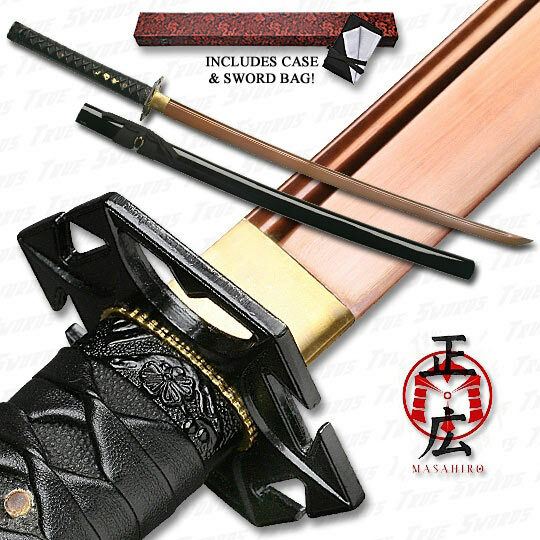 Musashi, Masahiro and Ryumon swords offer durability, affordability and exquisite craftsmanship all in one package! We've decided to put together a list of Katana that highlight certain characteristics of a functional sword. All the Katana featured in this buying guide pack a powerful punch for a more than affordable price! Sword collecting is like any other hobby, with time you become more knowledgeable about your passion. But there are a few things that you should know from the get go about what makes a functional Katana. 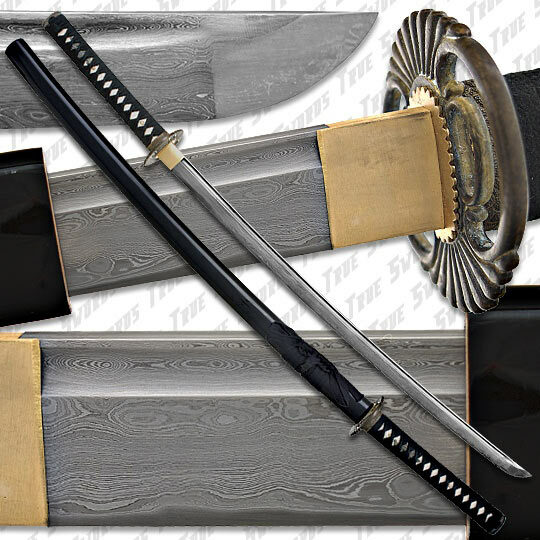 When purchasing a Katana, you want to be sure the sword is full tang, which simply means the sword was crafted from one solid piece of metal and the handle is pinned on to the blade. We also suggest sticking with Carbon Steel when it comes to the makeup of the blade. Carbon Steel is generally easier to sharpen and will hold the edge of the blade much longer than Stainless Steel. Last but certainly not least important is to establish if the sword has been heat treated. Through heat treatment, a blade develops the toughness in the areas of the blade where it is needed which produces a more durable sword. 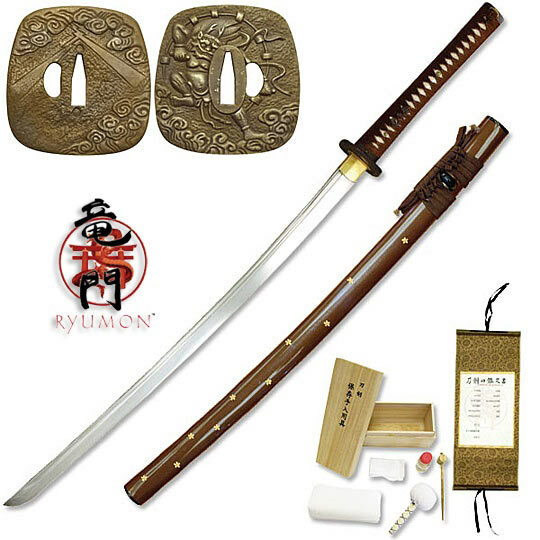 This battle ready Ryumon sword is hand crafted by master smiths in the "City of Treasure Sword", Longquan, China. Arguably the most aesthetically pleasing feature of this sword is the stunning hamon. Unlike some of the "hamon posers" who wire brush or print the hamon on the blade, this hamon is all naturally created with the temper process. 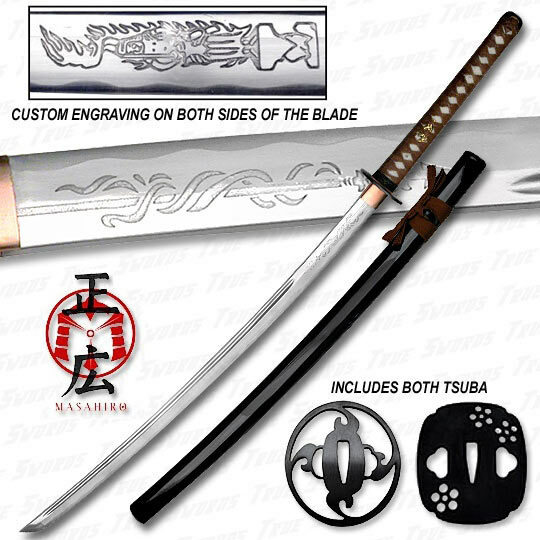 This sword comes with custom engraving on both sides of the blade that really make the Katana pop visually! The Shadow Warrior is also equipped with a full tang so you can rest assured that it can take some serious blows without cracking under the pressure! 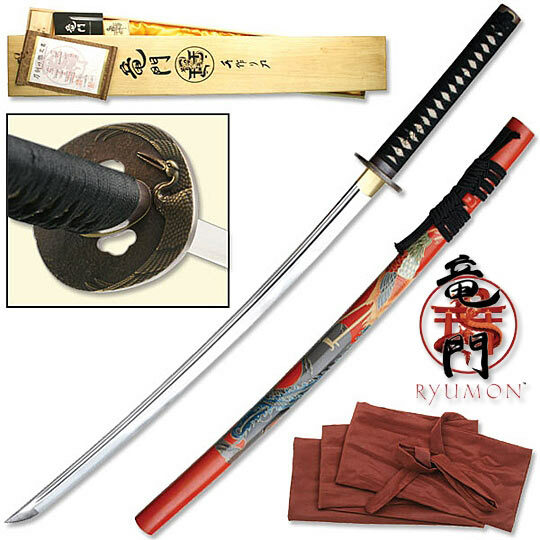 The blade on this sword is made with 1060 High Carbon Steel and features an authentic ray skin wrapped grip. One aspect that really makes Musashi stand out is the steel tsuba, or guard. The tsuba was an avenue to express the social standing, beliefs and taste of the owner. The sword masters that hand crafted this beauty left little to be desired. The AISI 1060 High Carbon Steel was tempered with the clay method producing a battle ready sword straight out of the box. The hand carved and painted scabbard is a work of art in and of itself! A picture simply cannot capture the stunning artistry of this Damascus blade. Each sword is hand folded and carefully shaped, thus guaranteeing that no two swords are exactly the same. But don't let the beauty of this Katana fool you, it's a beast also. The process of anodizing these blades ensures that the red, copper tone is forever fixed to the blade. The full tang construction is affixed with a bamboo peg which means the sword can be easily disassembled for care and maintenance.